It has been 100 years since World War first exploded in Europe, and in that century that the First World War fashioned, all participants have passed away, many to have never shared their stories of the war. Some had even allowed others to bask in all of the glory they equally deserved. Others never came home, or did so to be laid to rest in familiar ground. One of these Doughboys did so in the most hallowed of soil this nation holds dear. Here at this website the reader will have opportunity to sample, one section at a time, the first of the four Doughboys books. In serial form, the author will present an episodic release of the first book, Ragtime to Wartime – “Le’s Go!” the story of the real-life hero, James Reese Europe. In 1917, the Fifteenth New York National Guard regiment had been scrapped together against all odds. They had limited political support, the President of the United States had just won his office on the, “He kept us out of the war!” ticket so it was clear Americans had no interest in going to war in a foreign land in the first place, and what is more, the broader community the officers of the infant 15th were attempting to draw recruits from had little motivation to risk the lives of their sons for a country that hardly recognized them as citizens, and usually denied them rights to act even as fighting soldiers let alone officers. The 15th was known as the Fifteen NY Regiment Colored. Yet, this patriotic melding of black men, mostly from Harlem, were eager to serve and their motto, “Le’s Go!” was more than their battle cry, it was the sign of their commitment to overcome all obstacles to fight and win. Lt. James Reese Europe ready for action. 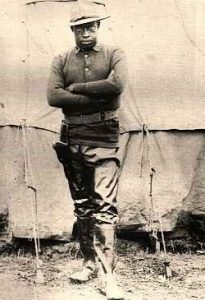 Lt. Europe was the first black officer of the United States Army to cross over into No-Man’s-Land. Armed only with the small pistol the French had given him, James, a musician and machine gun company officer joined in on a night raid right into the enemy trenches. The already famous American bandleader had dreamed of how his race’s music would make a difference in their futures, and how a unique all black regiment could help lift his people out of prejudice where the best they could hope for was being a porter or a Pullman car attendant. It is the true story of the Harlem Hellfighters and how they struggled for the opportunity to go fight against tyranny and for freedom. The following text is copyright protected. No portion of this text is available for use anywhere without the expressed written permission of the author. The French had set the borders of the 369th RIUS’s section of the front just wide enough for one battalion at a time to cover. As American regiments had three battalions, Hayward arranged one battalion on the front line, another in support, and the third in reserve, en repos. These rotated every ten days. The battalion at rest was about a mile and a half to two miles back of the front at Maffrecourt. For the next nine weeks the Black Americans of the 369th held this line, gaining experience and enduring the occasional raids the Germans sent, fearing each one to be the start of the next expected German offensive. It was while posted in the trenches facing Butte du Mesnil that the 369th RIUS heard of the price placed on their heads. They had begun to develop a reputation with the Boche. Since the Germans had taken none as prisoner to interrogate, the German Chief of Staff offered a prize of 100 marks for every black American soldier captured and brought back alive. 100 marks was an attractive reward for the average Boche, so there were many raiding parties that the men of the 369th had to “break up.” Through it all, they were very proud that the enemy never captured one of their regiment, though several times the Germans came close to earning the bounty. But, the Germans were not the only ones risking everything to gather intelligence information. The French also stealthily probed all along the German lines nightly. 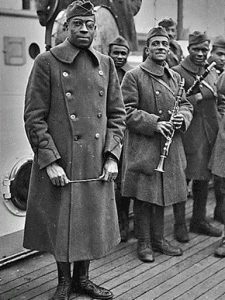 At the end of April Lieutenant Europe was preparing for a leave behind the lines where he would again see his colleague Noble Sissle, but before he did so, he decided to visit with some fellow French officers in the section just next to where the Harlem men held the line. Upon visiting the abris of his French comrades, he found the light-hearted group drinking wine and enjoying themselves with old battle stories in the covered trench alcove. Their cheery temperament should have served as a warning. The other French officer named d’Moquer sat laughing, “Delmonté do not flatter yourself,” then he turned to the American and handed him a tin cup saying, “Ever since ‘ee got zee Croix de Guerre at Verdun ‘ee ‘as been eempossible to leev wis.
Jim was astonished, not just at the thought that these men had repeatedly encountered the enemy, but were keeping a talley on the prisoners they had taken. Suddenly, he felt embarrassed at his own notion of semblance, and was ashamed of his boldness to equate himself with them. “Maybe zo,” d’Moquer admitted, “but no one ‘as captured more enemy machine guns zan Pierre and Henri and I ‘ave,” and as if on a signal Pierre and Henri, both officers as well, came through the dugout’s door. “Ah-ha, zere we ‘ave eet. Pierre and Henri, are we not a grand team?” And the three all agreed and toasted to each other for it. Placing a hand on the shoulder of Henri sitting next to him Delmonté spoke up, “Do not forget zee courageous Sous-lieutenant Cachette sitting ‘ere who single-handedly snuck een to zee Boche trenches and stole an Oberstleutnant’s orders and brought zem back. “Oh, Oui! an Oberstleutnant eez what you call a . . . ,” and he looked at d’Moquer with a question on his brow. “A Boche Lieutenant Cor-o-nel,” d’Moquer scoffed into his cup. Cachette started to answer, but in unison the rest answered for him, “Because I do not read Boche!” Then all laughed loudly again. Eventually, even the embarrassed Sous-lieutenant Cachette joined in with a smile. There was a short silence that instantly told Jim he had breeched a forbidden topic. d’Moquer interjected, “Like when Delmonté chased zee Boche chicken ‘ee spotted running loose een No-Man’s-Land.” Just the recollection of this event caused the others to laugh. Again all but Delmonté burst into laughs. d’Moquer added, “Eef ‘ee ‘ad brought back more zan just feathers I would ‘ave recommended ‘eem for another Croix de Guerre myself,” and they all laughed even louder. Lieutenant Europe respected these men and hearing them tell of their escapades caused him an empty feeling. Realizing his lack of experience, he saw his own military undertakings were like comparing the brawls of a ten year old and his sister to those of world champion boxer Jack Johnson. Jim desired to witness some of the hair-raising thrills of which they spoke. He also felt a desire to boost his own stock with these men he respected, and that he should also be upholding the valor of the American soldier. “Bravo, my friend! Zen, by all means, we must ‘elp you prove yourself to zee sheneral,” Delmonté asserted. One of the French officers hopped up and patted the American officer on the shoulder agreeing, “Tonight we are going on a raid across No-Man’s-Land right into zee Boche trenches to capture intelligence and take prisoners. You can go wis us! Suddenly James Reese Europe, the son of a slave, who back in New York had challenged centuries old customs and societal rules, who associated with the highest of the upper crust with ease was shaken and speechless. He had not actually considered going on a raid. It was just that it seemed the right thing to say at the moment. In fact, he agreed with the general. He also thought it too soon, that there was still more that he needed to know, to prepare for. There were so many possible pitfalls, and he scarcely knew of even one. His only hope was for Hayward to forbid it. But, to Jim’s surprise the colonel was only too glad to have his eager Lieutenant get the experience. He pulled back the curtain to the dugout and went in. These words were discomforting. The thought of actually being captured was one thing, but being shot and left in No-Man’s-Land to waste away, with no one knowing that his was even the body of an American shook him more. “To put on your ‘ead, Lieutenant,” came the answer. With that they all sat down, and Jim figured that now was the time he would hear about the plan, and get any life protecting advice. Instead they all began drinking from a bottle of wine until all of the Poilu officers with him were just as happy as larks on their way to the spring bird picnic. Lieutenant Europe attempted to join in with the merriment, but the best he could muster was what he was certain must have looked like one of those no-good, cheesy grins. As the Frenchmen enjoyed themselves, Jim began thinking of the band instead. How much he enjoyed standing before his favorite orchestra back in New York at Vernon Castle’s club. He thought how sweetly they played. In the next moment, the quartette stepped up and began singing “Sweet Emelina, my Gal,” and as he stood there wielding his baton to the jazzy strains of “The Memphis Blues,” he imagined once again all of the old familiar faces tripping by. One of them was his friend and department store tycoon John Wanamaker who put his hand on Jim’s shoulder smiling to him. Europe looked up at Delmonté’s face to realize where he really was. Had he fallen asleep? No, he could not have. Not with all of the tension he was feeling. But, it did not matter. The anxiety instantly returned and the words registered in his brain just the same as a death sentence which braced him up. It was the last thing they handed him before they struck out. Jim looked down at the little pistol that he thought was just the size of a child’s toy cap gun. He asked, “What good is this going to be against the Boche ‘Big Bertha’ cannons just ten miles away?” His focus stayed on the artillery that daily shook everyone’s teeth. Silently, one by one they filed out into the darkness. Not knowing the ground over which he was trudging, Jim continually stumbled in the intense darkness. As his French guides pressed on, the quiet became unnerving the closer they came to the most forward trench. Dark forms of enlisted men, members of the patrol, huddled at the sides of the trenches, speaking not a word. To Lieutenant Europe it seemed very unnatural. If only someone would clear their throat he would have been relieved, but none did. His own throat was also too dry for him to do so. It was like one of those terrible dreams he had as a child when he could not cry out nor awaken himself, only this time it was real. Jim’s heart skipped a beat. He had to shake off the image of a German knife slashing across his throat, or into his chest. Be sure not to miss it by SUBSCRIBING TODAY!